Hey it's me, your favorite killjoy, David Bitterbaum. Remember when I said how I just didn't, "Get," the Nintendo Switch? I discussed how it confused me, and I thought I was maybe out of touch? You may also recall how I found Labo pretty cool, and it made me start seeing some of the potential in the Switch. Well, it is now the end of 2018 and I'll admit, I do kind of want a Nintendo Switch. I did not at first, but seeing so many cool games coming out for it, hearing people say how much fun it is, and witnessing that the portable-aspect actually works pretty well and is handy helps me see that the Switch is pretty cool. Perhaps I just doubt Nintendo too much, as even though they may the have occasional massive failure (Wii-U) they other times make amazing stuff (Nintendo DS, original Wii, etc.) and the Switch has proven itself a pretty darn impressive device. 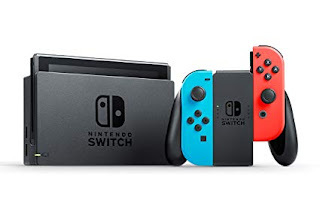 I'm not going to go out and buy one right away (its a pricey purchase), but I might start putting some money aside and in a year or so see where things stand in regards to getting a Switch. I know as my son, Clarkson, gets older he might love certain things that are Switch-exclusive, such as the cool Nintendo Labo, or that new, "Super Smash Brothers," which is the only fighting-game series I have ever been any good at, and adults and kids both love. It'll be fun to play video-games with him and the Switch might be a good choice to do so. Time will tell if I get one, but for now I do kind of want one.